Director Mel Stuart's 1971 adaptation of Roald Dahl's Charlie and the Chocolate Factory, first published in 1964, has garnered universal acclaim over the past four decades, despite poor box office results and a strong disliking from Dahl himself. 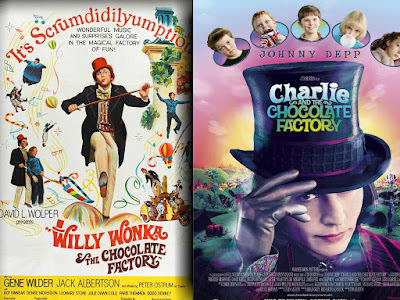 The author expressed anger at the film focusing too much on Willy Wonka over protagonist Charlie Bucket, as the title change suggests, as well as numerous other changes from his original source material. In spite of this, it's spirited visual style, memorable songs, and cherished performance from the late Gene Wilder make it a treasured piece of film for many people to this day. In the early 2000s, further development began of a new adaptation, which Tim Burton later signed on to direct. Acclaimed actor Johnny Depp took the helm as Willy Wonka, in a fresh modern take on the original story that, in spite of some changes of it's own, still fares much closer to the original source material. Depp's Wonka produced polarised results - many disliked his overly eccentric behaviour, whilst many enjoyed his comedic appeal yet subtle genius the character embodies. Either way, when released in 2005, the film earned a solid $475 million globally and, in the eyes of most critics, is a worthy contemporary update of Dahl's classic tale. Frequently, the films are compared, with the 1971 version usually dubbed the superior adaptation. Gene Wilder himself expressed extreme displeasure towards the 2005 film, calling it "an insult" and slandering Burton's numerous directorial decisions. But is all this bitterness deserved? Both films feature some memorable songs, though I lean hugely towards the upbeat, varied musical hits of the 2005 film; Willy Wonka features some poetic songs such as Pure Imagination and The Candy Man, but the repetitious "Oompa Loompa doopidy doo!" songs performed every time a child endures their comedic mishap go from tolerable to beyond irritating. In stark contrast, the Oompa Loompa's in Charlie, played brilliantly by Deep Roy, perform a diverse range of catchy musical numbers with varied lyrics and some fantastic background music by Danny Elfman; catchy is not their only perk, for they also intertwine many comedic lines and some lovely visual gags. Those in Willy Wonka may be likeable for a brief moment, but in the long run, they fail to generate consistent enjoyability. With the Oompa Loompas in mind, it must be said that the aforementioned Deep Roy brings much more wit and finesse to the role than the various actors who portrayed them in Willy Wonka, who donned strange orange makeup and green wigs alongside creepy, eerie voices. I appreciate that this is 1971 and the effects are limited, but regardless, their appearance is just beyond creepy. It's probably just a personal grudge of mine, but I never enjoyed any scenes that they starred in. Who is the best Wonka? This is the road I hate going down. There is a strong appeal in both Gene Wilder and Johnny Depp's performances, as both are talented actors whose careers clearly demonstrate their ability to play a diverse number of characters. In Willy Wonka, Wilder, again, portrays the character as a fatherly figure, with a somewhat snooty personality, but also one that shows how much respect he demands due to his ingenious ideas. He seems to be wise, knowledgeable, and this is all shown clearly on the surface. However, there is still a comedic, silly personality that occasionally comes forward, albeit in a very calm manner - he spits out a lot of funny lines and expresses his quirky self whilst maintaining composure in most circumstances, even in ones that demand disturbing reactions, which makes his persona all the more amusing. Much differently, Depp's performance shows Wonka as very childlike and goofy, but you can still see his talent and genius deep down. He lacks any sort of professionalism on the surface, and while this sometimes gets a bit too stupid, he still provides a lot of the films comedic charm. The exploration of a newly crafted backstory, his relationship with his dentist father (Christopher Lee), is a welcome narrative thread, and one that adds a nice touch of heartfelt complexity to what is otherwise a very simple story. I don't find it to be Depp's best performance, but when you compare it to his other roles and see how different he is here, it really exemplifies his remarkable acting talent. The actors of the children hold up well in both editions, though they can be slightly more annoying in Charlie, perhaps just due to their modernized, spoilt attitudes, for a lack of a better term. Protagonist Charlie, on the other hand, is performed equally well in both films by Peter Ostrum (Willy Wonka) and Freddie Highmore (Charlie), respectively. Both films have a pleasing visual style, with Burton's evidently being a bit more darker and twisted than Willy Wonka, albeit not too much that it becomes overly frightening - much unlike that ungodly random and freaky tunnel sequence from Willy Wonka, which is thankfully adapted into something more visually pleasing and enjoyable in Burton's version. Instead of CGI, this film's chocolate river was crafted with thousands of gallons of an artificial chocolate substance in order to give it a genuinely tasteful appearance, something that Willy Wonka lacked with it's lake of obvious, and rather gross, brown water. These points aside, you can't truly fault the aesthetics in either film, as they both have their own visual palettes that work in their own individual ways. Charlie is NOT a remake of Willy Wonka - this is something so many people don't grasp even a decade on, and something that is still applied to other adaptations of various stories. Burton and Stuart explored their own vision of what Dahl created, using their own interpretations and directorial traits. Again, Willy Wonka often outshines Charlie in the eyes of many, but for me personally, Charlie offers a much more enjoyable and briskly paced narrative, complimented by some fab music, generally solid performances, and of course a compelling (if sometimes too pale) visual style. Willy Wonka is by no means bad, and of course remains iconic and memorable, but it was never a film I wanted to come back to over and over. However, in hindsight, they both work in their own unique way - simply saying which is better seems too crude. It all comes down to personal preference, and that's why overall reception of many adaptations is an interesting topic.